The Cavaliers are pleased to announce the appointment of current director Jeff Fiedler as the full-time director of the corps. Fiedler, 47, has directed the Cavaliers as a 'part-time' position since September of 1990 after taking the reigns from Adolph DeGrauwe who had led the corps for 10 years. 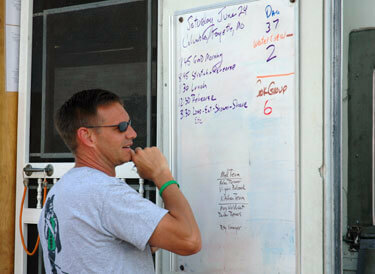 Jeff Fiedler sets the corps' schedule on tour this summer in Columbia, Mo. His full-time position had been as a teacher and then later as an administrator at St. Francis de Sales High School in Chicago, since the fall of 1987. He also is the current chairman of the Drum Corps International board of directors and had been serving as the president of the Chicago Archdiocesan Marketing Association since 2003. Fiedler started in the classroom at St. Francis de Sales, teaching social issues and social justice to junior and senior students, later becoming the senior moderator and department chair, before accepting an administrative position in the fall of 1997. There he headed the school's marketing and recruiting efforts, as well as the disbursement of scholarship and financial assistance. He was voted "Senior Teacher of the Year" four times while in the classroom at St. Francis de Sales. Read more on www.cavaliers.org.